Every four days, a new illicit synthetic drug enters the world market. 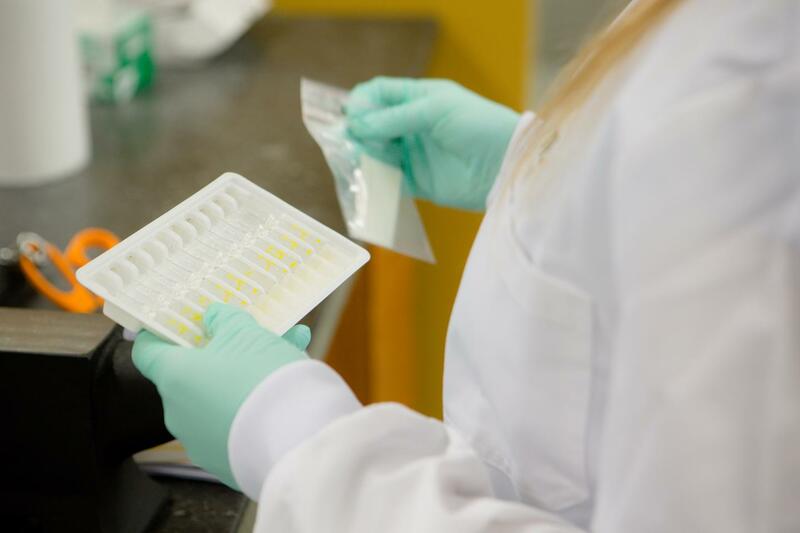 These drugs, which are designed to mimic established drugs of abuse, are cheap, often highly toxic, and difficult – if not impossible – to detect using standard presumptive drug testing methods. Until now. A colour test developed at the University of Technology Sydney (UTS) that can accurately detect the presence of all cathinones has been commercialised by Germany-based company ESA-Test. Developed by Dr Morgan Philp, Dr Ronald Shimmon and Professor Shanlin Fu in the UTS Centre for Forensic Science, the test is now being sold in Europe. Colour testing is an established method for identifying the presence of drugs of abuse, particularly for police and security personnel. However, prior to the release of the cathinone test, the technology had not been successfully adapted for use with new psychoactive substances. “There are no other colour tests that uniquely identify new psychoactive substances and only new psychoactive substances – there are colour tests that will react with some of those compounds but not with all drugs in that class,” Dr Philp says. Colour tests are performed by combining a suspected drug substance with the colour test reagent, with the resulting colour change indicating the presence of a particular drug. Confirmatory analyses are then required to verify the results. The ease of use of this sort of test means that it can be deployed in the field, such as by law enforcement personnel, rather than requiring specialised forensic science expertise. “If you receive a sample powder or liquid and you want to determine what drug it is, you do a simple presumptive test, usually at the scene,” says Dr Philp. ESA-Test is now marketing the UTS cathinone test to police and customs agencies in Germany, and has also identified corrective services, hospitals and health care environments elsewhere in Europe as potential future markets. In addition to marketing the test to European clients, ESA-Test is further developing a photometric reader that can be used in combination with this colour test and other well-known colour test reagents to further distinguish between different illicit substances present in a sample. “The idea is that all of these colour changes are not similar, because you’re dealing with different molecules, so we assumed that it’s likely that there are slight differences in the photometric spectra of each colour change,” says ESA-Test’s Head of Innovation in Toxicology, Tobias Scholl. The cathinone test is one of a suite of drug detection tools being developed in the Centre for Forensic Science. The research team recently patented a new test for NBOMes and is currently working on colour tests for other synthetic drugs, including 2Cs, anabolic steroids and synthetic opioids, particularly fentanyls. The research team is seeking collaboration opportunities with industry partners who are interested to translate these new laboratory tests into real-world applications.